From Galium aparine L. herb lipophilic complex of biologically active substances had been obtained for the first time. By means of TLC and chromatography-mass-spectrometry the composition of lipophilic complex had been studied. 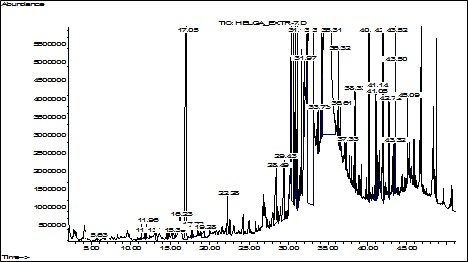 3 Sesquiterpenoids, squalene, 7 aromatic compounds, higher alkanes and their derivatives, fatty acids have been identified and quantified; presence of chlorophylls, carotenoids and 2 iridoids had been established. Antibacterial and antifungal activity of Galium aparine herb lipophilic complex and degree of these activities have been studied for the first time. Test-strains of S. aureus, P. aeruginosa and C. albicans were highly sensitive and B. subtilis is moderately sensitive to lipophilic complex of Galium aparine herb. Olga V. Goryacha, Tetyana V. Ilyina, Alla M. Kovalyova, Nataliya V. Kashpur. Phytochemical research of Galium aparine L. Lipophilic complex and study of its antibacterial activity. 2014; 3(1): 07-10.